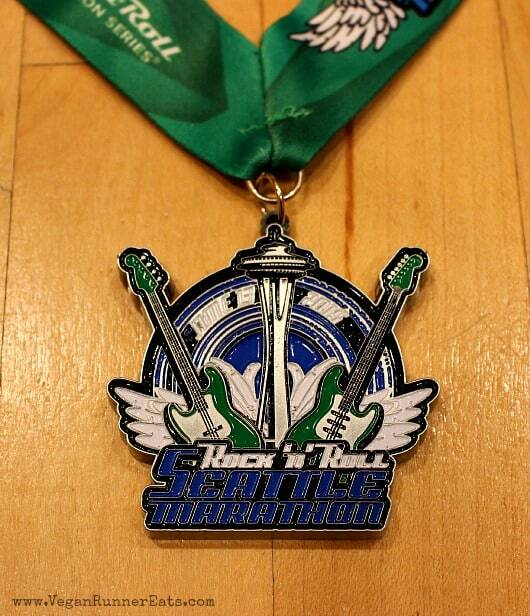 Wow, it’s still hard to believe that 2015 Rock’n’Roll Seattle marathon – a race that occupied my mind and my training log for the past five months – is already behind us! I’m still struggling to gather all my thoughts together and write a race recap, so let me just say here: this marathon was a lot of fun, and like the two of my previous marathons, it taught me a lot! So where do I start my race recap? With the stats! In case you don’t want to scroll all the way down to see my results (although I’d love it if you stick around! ), I ran this marathon in 4:15:12. Not my fastest marathon time, but not bad at all for a challenging course with lots of hills in the second half. A big improvement over my previous two 26.2’s is the fact that I managed to run the whole time without slowing to a walk (I did stop a couple times to refill my water bottle though). Also, I managed to run the first 10k in about the same time as the last one, and ran the last mile faster than the first one (9:17 vs 9:39). Since I don’t possess the talent of being able to write short posts, I’ll start my narration with the evening before the race. ‘T was the night before the marathon, and all through the town of Seattle the traffic was terrible as Rob and I tried to get to the pre-race expo and pick up my race bib. We both worked on Friday, so getting to the expo early wasn’t meant to happen. Thankfully, we got to our destination eventually, and after paying more for 30 minutes of parking than for our dinner later on, we went on to pick up my race package. There were a lot of cool vendors at the expo, but it was getting late, so we had to leave soon after we got my race bib. We settled in a hotel not far from the legendary Space Needle that was going to be the starting point of the race the following morning. Since driving and parking in downtown Seattle is pretty tricky on Friday night, we decided to walk to the closest vegan restaurant we knew of for dinner – Veggie Grill. While it’s more of a healthy vegan fast food than a sit-down-and-spend-your-whole-night restaurant, we found it perfect for a low-key dinner. Veggie Grill changes their menu all the time, so this time around they didn’t have any pasta or carb-heavy dishes available. I wasn’t too concerned since I’d done plenty of carbo-loading in the days leading up to the race (I’ve talked about my nutrition strategy in this post). I ordered the Bombay Bowl that had some supergrains in it along with lots of kale and vegetables (no pic here as my cell phone camera wasn’t cooperating). ‘Kale before a marathon?!!! Isn’t all that fiber a no-no before a race?? ?’ Yes, I decided to test my luck, and the next day everything went just fine! The night didn’t give us a chance to sleep well as the air conditioner in our hotel room rattled like an empty can all night long. Once the alarm went off at 4:45, I got up and proceeded to eat my overnight oats (chopped dates, chia and pumpkin seeds soaked in cashew milk + water) with a cup of green tea. I sprayed myself head to toe with Coola SPF 30 sunscreen that my boss sent me off with to prevent burning to a crisp on a bright sunny day (Coola is cruelty-free and as all-natural and organic as sunscreen goes). I packed four GU gels into my fanny pack, and made my signature drinking concoction of water + an electrolyte pill + a small packet of iodized salt (I’ve explained why I’m adding salt to my sports drinks over here). Another salt packet or two also went into my fanny pack. After some nervous bouncing around the room, we set off for the starting line. It was a beautiful morning, sunny but cool. 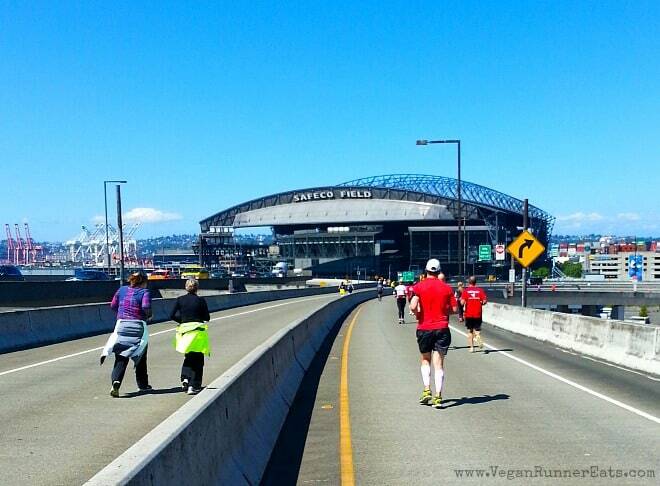 All of the 17,000+ participants were arranged into corrals by their expected finish time. 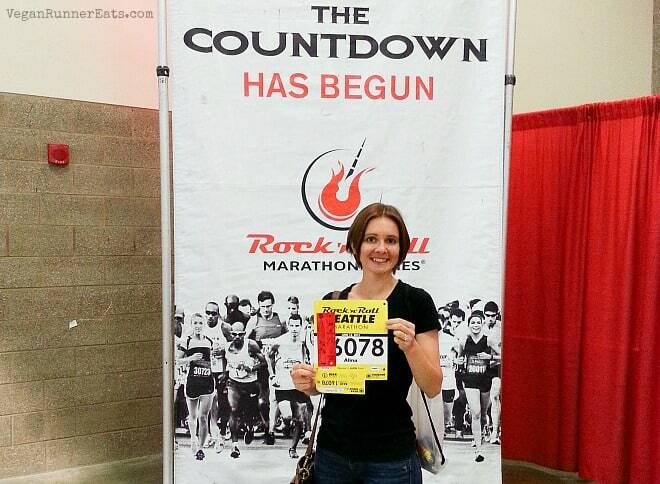 My expectation of 4:15 (more of a prediction, as it turned later) put me into corral 16. The atmosphere was pretty low-key, so Rob got to hang out with me almost until my corral passed the start line. 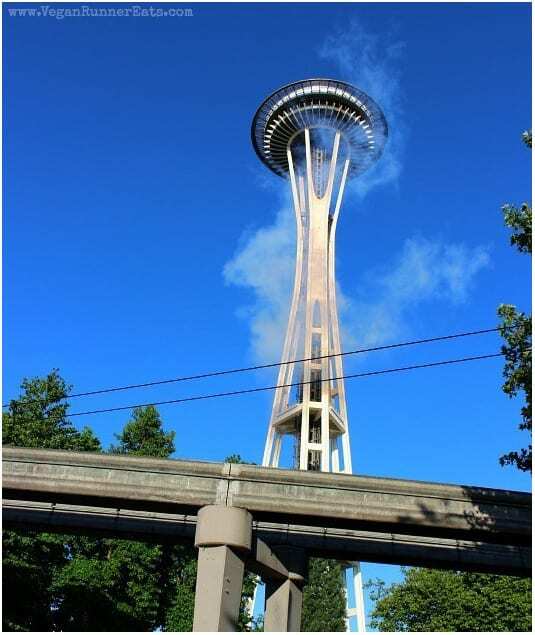 At 7 am, the Space Needle passed some gas produced some fireworks, and the race started. It took another 20 minutes or so until my corral made it to the start, and on we went! I didn’t feel my strongest because of the lack of sleep for the previous few nights, but the cool morning air felt very refreshing. I kept reminding myself not to go out too fast, but honestly I didn’t have it in me to go any faster than 9:30 – 9:40 pace at this point. About a mile in, I started talking to a fellow runner named Ben who was going at about the same pace. It turned out that this was Ben’s 5th marathon, and besides long distance running, he’d also done two Ironman triathlons. We went on to pace each other for the next 20 miles or so, and I learned that Ben was a Seattle-based personal trainer who also happened to be vegan! But one thing that impressed me even more was the fact that he was born with cerebral palsy in one of his legs, and still went on to participate in multiple athletic endurance events like marathons and Ironman triathlons! I couldn’t help but feel like a lazy couch potato who complains about silly things all the time compared to him. What’s your excuse for never doing any endurance races? By the way, Ben has his own site and a blog called Greene Multisport for his personal training business, check it out to learn more about his inspiring life journey. The first half of the race was relatively flat, and since Ben and I were running at a conversational pace without pushing ourselves over the edge speedwise, running turned out to be pretty enjoyable. The course was laid out to go past some pretty picturesque places like Lake Washington and Seward Park (you can see the course map over here, pick the ‘full marathon’ option). Various music bands were playing their tunes every mile and a half or so, which provided some entertainment and cheered us up. After 15 miles, we set off to run over the highway I-90 bridge over Lake Washington leading towards Mercer Island. The bridge started off downhill and then went flat, so other than the sun shining on us as hard as it could the bridge running turned out to be fine. My feet, however, weren’t feeling their happiest anymore because of all that pounding on the asphalt and concrete. During training, I often ran on softer surfaces like the curb of the road or the grass of my neighborhood golf course to give my feet a break. Now I learned that I should have kept running on soft surfaces to the minimum while training to get used to racing on hard roads. 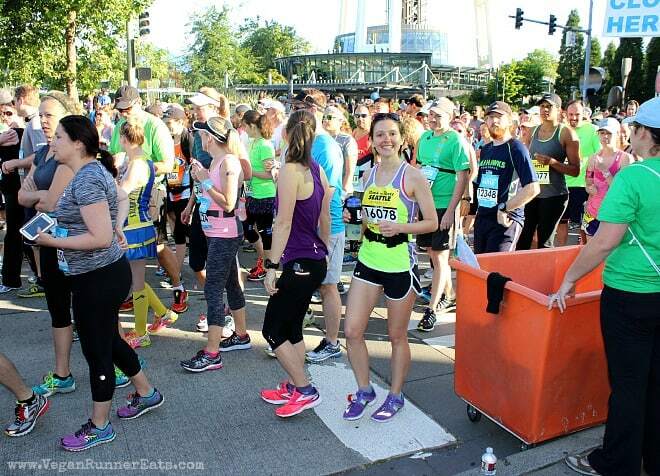 The Mercer Island loop of the marathon included running through two tunnels. The first tunnel was quite long, with a music station halfway through that played some weird New-Agey tunes with ethnic drums and dancing lights. I wasn’t a huge fan of that, and just thanked my lucky stars that I don’t have claustrophobic tendencies, or otherwise I would have been quite miserable running through that. Also, my GPS got messed up going through this tunnel and the next one, but by that point I didn’t care much, and just ran by feel. The second tunnel leading back on the mainland after the bridge in mile 21 turned out to be all uphill, but surprisingly running up felt quite easy to me at this point. There was also some of that weird music, but thankfully this tunnel was shorter. I passed lots of people who had slowed to a walk, and came out after the tunnel determined to push myself as hard as I could to make it to the end without taking walk breaks. By this point, I had refilled my water bottle twice with a mix of race-provided Gatorade and water with an iodized salt packet I had brought with me. I also ate two GU gels at one hour and two hour marks, and was wondering if I needed to break out another one, but my stomach wasn’t craving any. It turned out that just my Gatorade mixture was enough to take me to the finish. I didn’t take a lot of pictures during the race because A) I didn’t want to stop, and B) I thought that I could buy some pictures later from the race photography site, but since those services still charge an arm and a leg for their photos, you’ll have to settle for these few. My biggest surprise during the later stages of the race was the fact that uphill running felt like a piece of cake to me! I thanked every single hill I ran up during training on Whidbey Island, and particularly the half-a-mile-long hill in my neighborhood that I conquered in every one of my long runs. The last hill happened about half a mile before the finish line. The excitement of seeing the finish in the distance, and the realization that I successfully did what I wanted to do for the last five months put an extra spring in my step. I crossed the finish line in 4:15:12. I saw Rob almost right away behind the fence, grabbed some water and Gatorade and left the fenced-up finisher’s zone. We walked towards the big celebration field in Seattle Center. The pain in my lower body got stronger after I stopped, which I was familiar with from my previous marathons. Thankfully, we spotted a Gaiam yoga tent that had lots of yoga mats, foam rollers and other helpful tools for anyone to use, so I jumped on the opportunity to do some foam-rolling for 10 minutes or so. That brought a huge relief to my lower body pain, thanks Gaiam people! Another thank you goes to the hotel we were staying at, for letting us have a late checkout at 1 pm. For that alone, I forgive you the rattling can of an air conditioner :). I felt much better after taking a shower – big surprise, huh? I still hadnn’t eaten anything solid by then, only drank water and Gatorade – I don’t advise anyone to do so, but my stomach just wasn’t ready for solid food yet. For lunch, Rob and I went to the Wayward Vegan Café because it never disappoints to provide higher-calorie comfort foods. 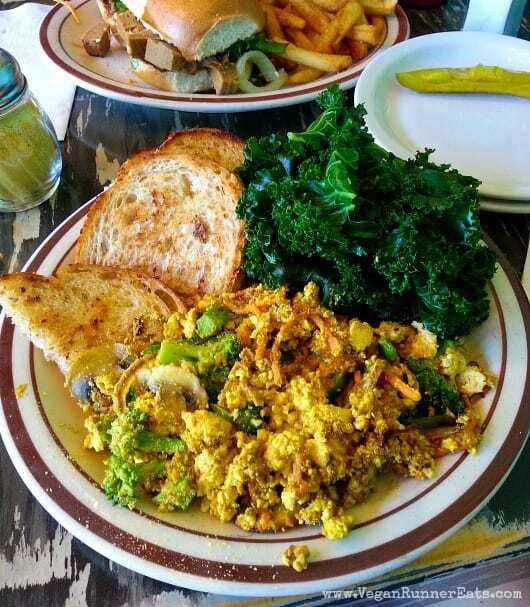 I ordered the Lost Souls Scramble that came with steamed kale and toast, and it tasted like the most delicious thing I’ve had in a while! Rob’s Seitan Philly is peeking through in the back. And now, for the wisdom-sharing part! 1. If you’re a fan of running on trails or grass but your goal race will be happening on asphalt/concrete, run the majority of your training runs – especially the long runs – on harder surfaces to get your feet used to the pounding. This is a piece of advice that I’ll be telling everybody now. Here in the Pacific Northwest, we have lots of beautiful trails that are tempting to run on, especially if we’re injury-prone, because the softer natural surfaces provide plenty of relief for our feet. However, once we set out to do a road race, all that trail running will do us a disservice as our feet will get tired way before we would like them to. 2. You can eat something other than a giant bowl of pasta for your pre-race dinner! Of course, it helps if you load up on healthy plant-based carbs in the days leading up to the race (think potatoes, yams, squash, whole grains), but a fiber-rich meal the night before will travel through your system and clean out everything you don’t want to bring with you to the race (read: you’ll have a successful bathroom session in the am). 3. Don’t be a slave to your GPS during the race. Knowing your mile splits and pace is a good thing, but it can easily drain all of the enjoyment out of racing, and you may start getting frustrated with yourself. Instead, treat your GPS readings as a guideline, a monitor of your progress, and try not to get mad at yourself if your pace is slower than you’d like it to be. 4. Listen to your body and make adjustments to your race plan as needed. It’s ok to run the first half of the race slower than you expected – that will help you conserve energy for the later stages of the run. Not that I’m evil or something, but I felt a tinge of satisfaction when passing lots of people in the last few miles of the marathon. 5. Keep your electrolytes up! 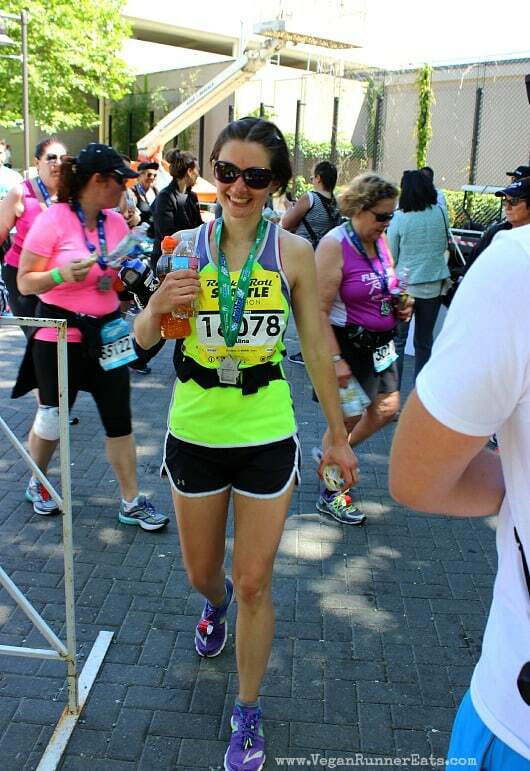 Bring some training-tested fuel with you, whether it’s sports gels or something all-natural (see what the readers of Vegan Runner Eats have suggested), and keep hydrating throughout the race with an electrolyte drink. I always bring a hand-held bottle to sip on so that I don’t depend on what the race has provided. 6. Got a chance to do some stretching and/or foam rolling right after the race? Go for it! A lot of blood pools in our lower bodies after running a marathon causing pain, so even a few minutes of foam rolling will help break it up and kick-start recovery. I was lucky to find a foam-rolling station after the race, but if you’re not sure your race will provide that, bring a foam roller to your hotel from home and use it there. 8. Most of all, have fun during the race! You’ve put in all that effort into training, so might as well take the most enjoyment out of your race! Also, check out everything I’ve learned during my marathon training over here. A huge thank you goes to my lovely husband Rob, who once again patiently dealt with all of my training- and racing-related anxiety, supported me during my injury scares, waited for me during the race, and took a bunch of pictures for this post! I love you! 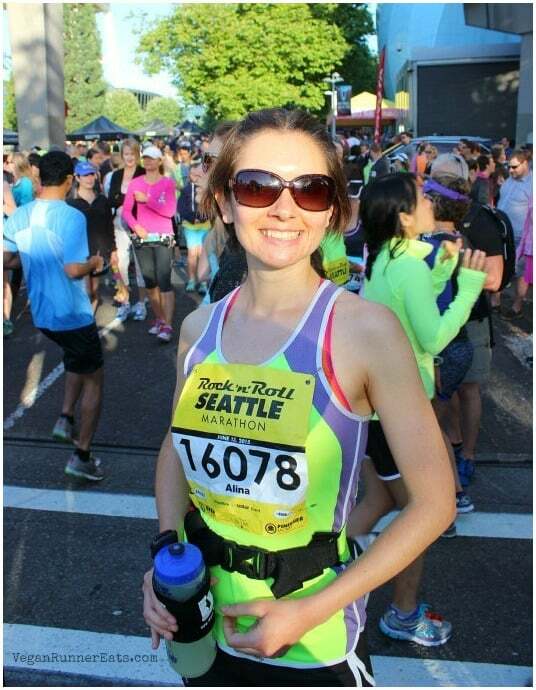 Tagged marathon training, race recap, Rock'n'Roll Seattle Marathon, running tips. Bookmark the permalink. Awww thank you, Ruthanne! Yes, I’m toying with the idea of taking up trail running since it’s easier on the feet, plus here in the Pacific Northwest we have so many beautiful trails! There’s another fitness challenge that I’m thinking about right now (not running-related), but it’s kind of intimidating, so I’ll announce it in due time. Thanks The Vegan Junction! The trails are calling my name, so it’s very likely that I’ll go run in the wild sometime soon. I am doing the Rock n Roll Marathon in Savannah and this post got me SO excited for it!! Thanks for sharing!! Awesome, Alana, good luck with your race!